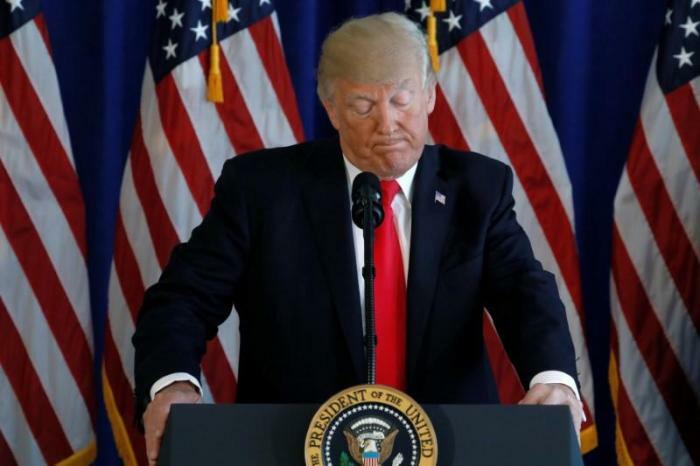 President Donald Trump is being condemned by lawmakers from both sides of the political aisle for not specifically naming white supremacists in his response to the violence in Charlottesville, Virginia, on Saturday. On a day in which one person was killed and many were injured — because police on the scene were ordered to "not intervene until given command to do so," according to the ACLU — when violence broke out between counter protestors and white supremacists who planned a protest rally over the removal of a Robert E. Lee statue, the president's response to the unrest left much to be desired for many because he did not explicitly name white supremacists, the Klu Klux Klan, neo-Nazis or other white nationalist socialist groups that were at the rally. On Sunday, however, the White House released a statement clarifying that Trump's Saturday statement condemning the violence also included "white supremacists, the KKK, Neo-Nazi and all extremist groups." "The president said very strongly in his statement yesterday that he condemns all forms of violence, bigotry, and hatred," the White House said. "He called for national unity and bringing all Americans together." "We condemn in the strongest possible terms this egregious display of hatred, bigotry and violence, on many sides. On many sides," Trump said during a press conference Saturday. "It's been going on for a long time in our country. Not Donald Trump, not Barack Obama. This has been going on for a long, long time." According to reports, Trump left the press conference without answering questions from reporters about whether he condemned white nationalist groups that claimed to have backed him over his rival Hillary Clinton in the 2016 presidential election. 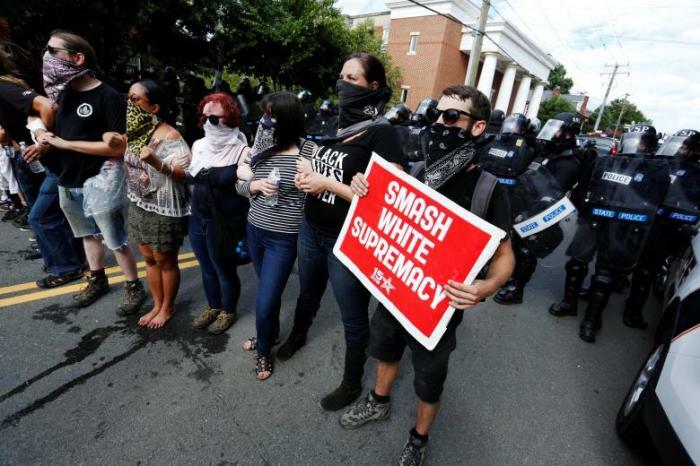 As some have tried to link Trump's rhetoric to the violence that occurred in Virginia, both Republican and Democrat politicians were quick to respond with their condemnation of the president's percieved unwillingness to condemn white supremacists on Saturday. "Mr. President — we must call evil by its name. These were white supremacists and this was domestic terrorism," Sen. Cory Gardner, R-Colo., wrote in a tweet. Sen. Marco Rubio, R-Fla., one of Trump's 2016 presidential campaign rivals, issued similar thoughts in one of his tweets. "Very important for the nation to hear @potus describe events in #Charlottesville for what they are, a terror attack by #whitesupremacists," Rubio wrote. Liberal lawmakers were also angered by the president's response. Sen. Bernie Sanders of Vermont, an Independent who caucuses with the Democrats, took to Twitter to voice his outrage. "No, Mr. President. This is a provocative effort by Neo-Nazis to foment racism and hatred and create violence. Call it out for what it is," wrote Sanders, whose former campaign volunteer, James Hodgkinson, now deceased, tried to assassinate Republican members of Congress during a baseball practice in Virginia back in June. Former Speaker of the House Newt Gingrich, a Trump supporter, agreed in an interview with Fox News on Sunday that the president should speak out "more aggressively" against the white nationalist extremist groups, such as the ones that were in Charlottesville over the weekend. "I do think the president should speak up more clearly. And I suspect today or tomorrow he will," Gingrich said. "I do think if you're — if you're fair to him, the statement itself was pretty strong and pretty direct about condemning the violence, condemning bigotry. I mean he talks very specifically about condemning racism. But I agree, I think that clearly he should talk out much more aggressively about it." Trump's initial response to the violence was praised by some white nationalists. Business Insider reports that the founder of the neo-Nazi and white supremacist website Daily Stormer, Andrew Anglin, praised how Trump — whose son-in-law Jared Kushner and daughter, Ivanka, are both Jewish — "outright refused to disavow" the far-right movement. "He refused to even mention anything to do with us. When reporters were screaming at him about white nationalism he just walked out of the room," Anglin was quoted as writing. The criticism received by Trump comes after President Barack Obama was criticized by many on the political right throughout his presidency for not condemning radical islamic extremists when responding to various deadly terrorist attacks in the U.S. and around the world. Additionally, neither Obama nor his Secretary of State John Kerry attended a solidarity rally in Paris, France, days after islamic extremists conducted a deadly attack on the office of the satirical newspaper Charlie Hebdo in 2015. The rally was attended by the heads of state of over 50 nations.